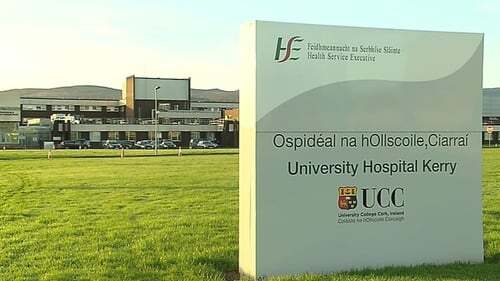 A report on a review of 46,000 radiology scans at University Hospital Kerry has found that 11 patients had their diagnoses of cancer delayed and four of these patients have since died. These involved the work of a locum consultant, who no longer works at the hospital. RTÉ News has also learned that since the review began, a further eight serious reportable events have been uncovered. The report finds that the 11 patients involved had their diagnoses delayed. It also finds that the delayed diagnoses had a serious impact on their health. The report also reveals that the review uncovered three patients with undiagnosed cancer who had not previously been identified. All 11 cases are now subject to further investigation and analysis, with results being shared directly with the patients involved and with the families of those who have since died. The four patients died in the time between the identification of their delayed diagnoses and the publication of the review today. The report said that the delay in diagnosis in a small number of the 11 cases did not impact on the treatment options available for curative intervention. The Chief Operations Officer of the South/South West Hospital Group has said he "sincerely and unreservedly apologises" to all the patients and families at the centre of the review. Speaking on RTÉ's Six One News, Dr Gerard O'Callaghan said "the delay in treatment had a serious impact" on the 11 patients involved, as he said it would have affected their ongoing treatment. Dr O'Callaghan said the review focused on significant clinical errors. He said there were other minor errors that would not have impacted on the patients, which he said the Medical Council will review. He also said hospitals outside the main population centres have great difficulty in recruiting consultants in certain specialities. The review was conducted on 46,234 scans, involving 26,754 patients. A total of 422 of those patients were recalled for repeat scans, of which 59 required further clinical follow-up. Ten of those patients were referred to other hospitals for specialist care. Just three of the 11 patients who had a delayed diagnosis were identified through the look-back review of scans. Other patients were identified when they re-presented to the hospital, while the audit was under way. Also a number of other patients were identified during separate hospital reviews. The delays in diagnosis and treatment ranged from two days up to 76 weeks. Nine of the 422 patients identified for recall could not be contacted. The report says they were patients who were visiting or temporarily living in Kerry at the time of their radiological examination and the contact details they had given were no longer valid. All of these patients were deemed to be of low risk by the review team. The review found that there was "a substantial rate of unreported clinically significant findings" requiring review, to determine if patients should be recalled. The executive summary of the report concludes that while patients were exposed to risk, the majority of patients did not suffer any direct harm. Overall, it found that 105 scans required immediate referral to a clinical group, as the previously unreported finding was of "potential significant clinical concern". In the case of 44,831 of the scans, there was agreement with the original report, or a minor abnormality "of no on-going clinical significance" was identified. In the case of 1,298 other scans, they were reviewed by a clinical subgroup as a previously unreported finding was unlikely to be of clinical significance, however it was felt that the patient might require rescanning. The review report has said that all patients whose images were referred were reviewed. The care of patients requiring clinical management has been transferred to the appropriate service. It said that all patients have been written to with the outcome of their review. The report said that all patients and their families, where a delay in diagnosis was identified as having a serious impact for the patient, have had full disclosure. It said that communication continues with all patients and or families through the hospital. The review recommends that an external review of the radiology department at University Hospital Kerry should be commissioned by the South/South West Hospital Group. The review said that at national level, the HSE and the Faculty of Radiologists should also work to define acceptable volumes of work for individual radiologists. It has recommended that the hospital oversee a review and enhancement of the incident reporting process, to ensure it is capturing disparities between the clinical diagnosis and the subsequent radiological report. There should be monthly business reports for the radiology department, with defined and agreed metrics. It has also made recommendations for quality monitoring, improvement of services, peer review and performance monitoring for professional staff. Patients of University Hospital Kerry who have any concerns following the publication of the look-back review report can contact the helpline on 1800 742 900. It will operate up to 9pm this evening, and from 9am - 5pm from tomorrow onwards. The helpline captures patient contact details, which are passed onto clinicians for further contact.